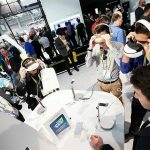 Self-driving vehicles and everyday robots were a highlight of CES 2017. 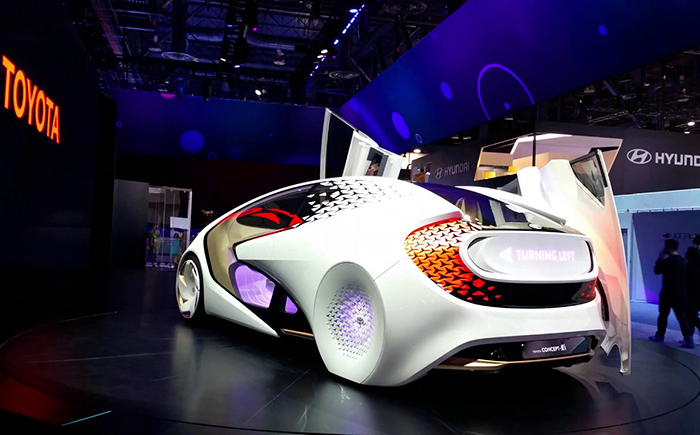 This year’s Self-Driving Technology Marketplace was filled with a variety of vehicles with futuristic styles and unimaginable designs. 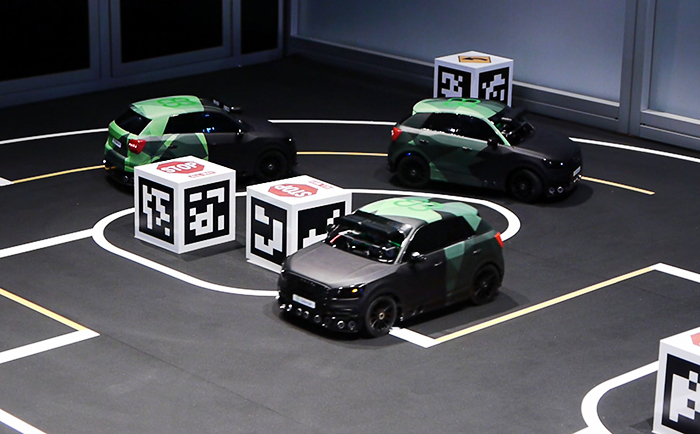 Some of the most sought-after features such as parking assist, collision avoidance, and emergency braking were demonstrated by the world’s leading automobile manufacturers. Robotics Marketplace was another area that attracted much attention. From a dancing robot to an intelligent modular robot, robots were dominating the show. 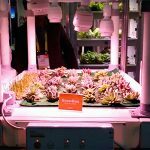 Here, we introduce a list of the coolest and the most innovative product demos from CES 2017. It is only a matter of time before self-driving vehicles take to the streets all over the world. A large number of established automakers are already working to make autonomous vehicles a reality. The current technological revolution and investments in the field promise that self-driving cars will join the roads within the next 10-20 years. While the infrastructure for self-driving cars to safely communicate with other autonomous cars and their surroundings is currently being developed, autonomous vehicles will eventually have to also learn and adapt to interact with traditional cars and roads. There are no definitive answers to when the transition to fully autonomous cars will occur or whether people would ever want to truly give up driving. In fact, many people enjoy driving as an activity and attribute social meaning to it. 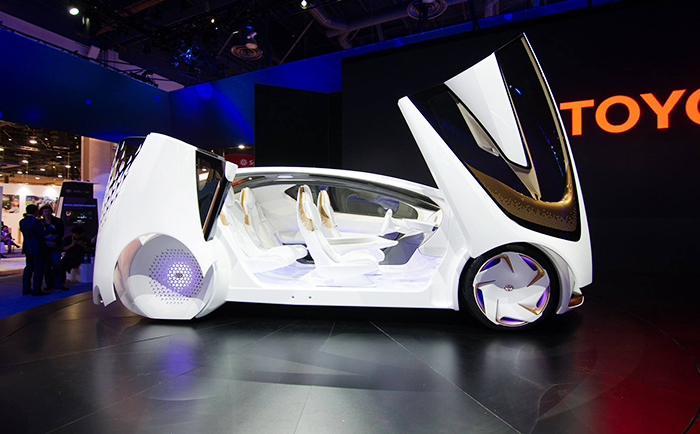 However, there is no doubt that autonomous vehicles are becoming the center of the automotive industry’s future. 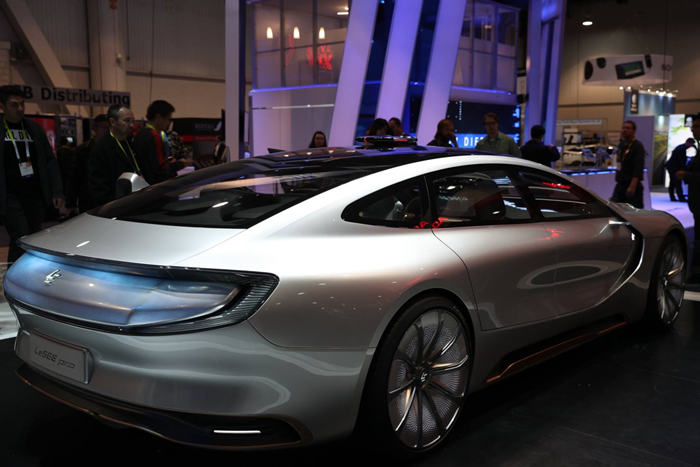 LeEco’s LeSEE Pro is an electric autonomous prototype with futuristic looks and features. The exterior can project five distinct colors on its body informing other drivers and pedestrians of the vehicle’s operational mode. The steering wheel folds up into the dashboard when it’s in autonomous mode. Instead of a traditional level 2 port found on most EVs, the LeSEE Pro uses a magnetic charging system. The owner can attach the charging cable to an area in front of the driver or passenger side door. The car is also equipped with intelligent back seats, allowing the user to mold them into their own shape for optimum comfort. 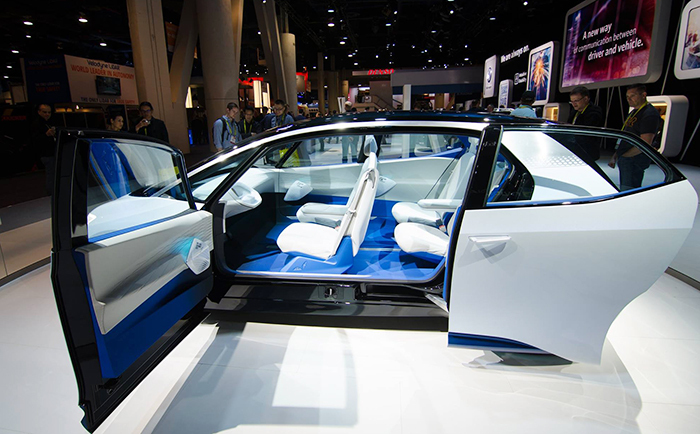 Hidden armrests, cup holders, and inductive charging surfaces for mobile devices add to the futuristic feel. Figure 2. LeSEE Pro’s steering wheel folds up into the dashboard when the vehicle is in autonomous mode. Figure 3. 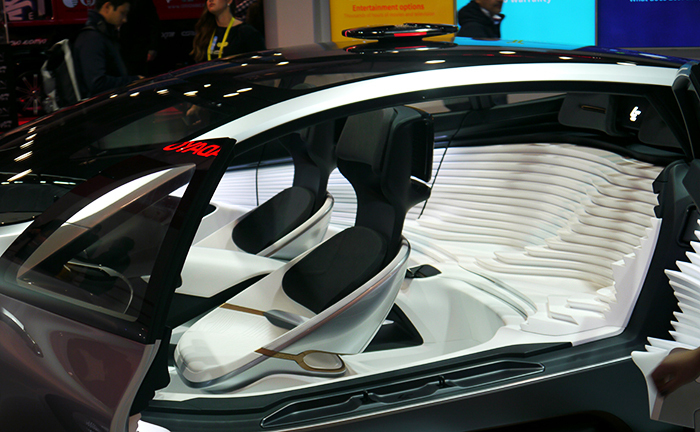 LeSEE Pro’s interior has a futuristic design with intelligent back seats that mold to fit the occupant’s shape. 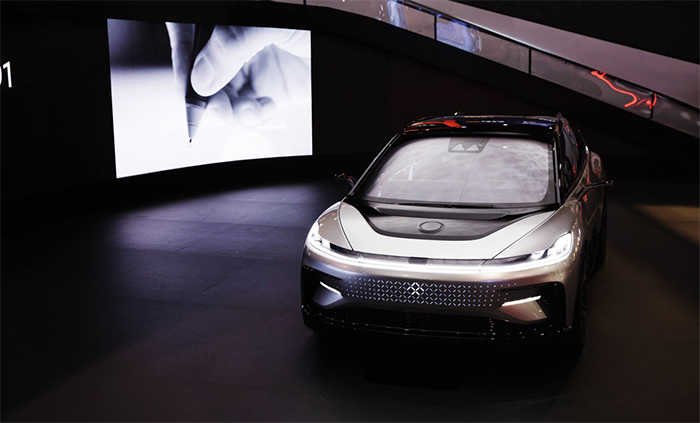 Faraday revealed its FF91 model at CES 2017. 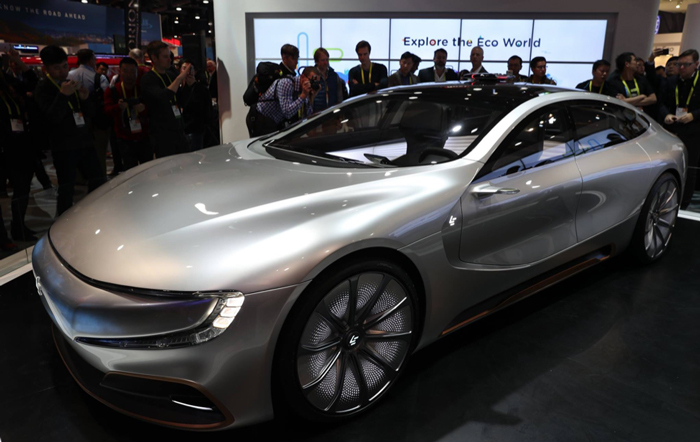 The vehicle is expected to cost under $300,000, and it features self-parking technology and a 130 kWh battery pack which provides enough power to go as far as 378 miles. Faraday claims FF91 can go from 0 to 60 mph in under 2.5 seconds. 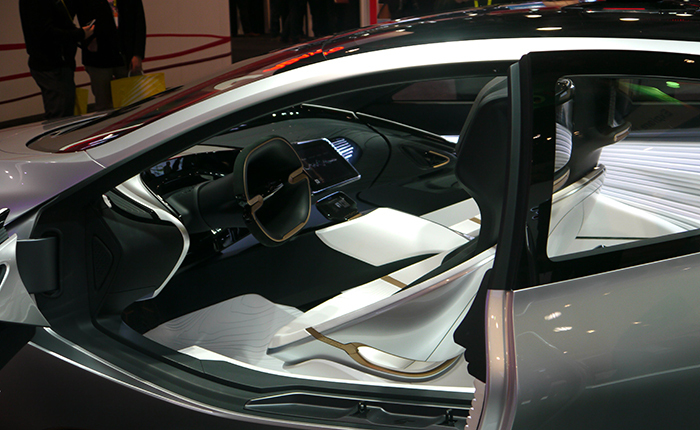 The FF91 embraces touchscreen technology, removing almost all physical buttons. The side mirrors are replaced with cameras, and its video feeds are merged with the rear camera to create a rear-view free of blind-spots. FF91 completely removes the need for a key. Access is granted via a mobile app or the car’s facial recognition technology. The driver is able to create an individual driver account to save settings like seat position, AC-preferences, and music stations. The Urban Mobile Box is an electric autonomous vehicle designed to serve strictly localized needs. It is specifically aimed at transporting people in semi-closed environments like theme parks, university campuses, resorts, and so forth. Equipped with ultrasonic sensors and wireless charging capability, the Urban Mobile Box can be manually navigated via remote control or operate on its own. Trials for the vehicle are to start sometime this year in China. Figure 6. 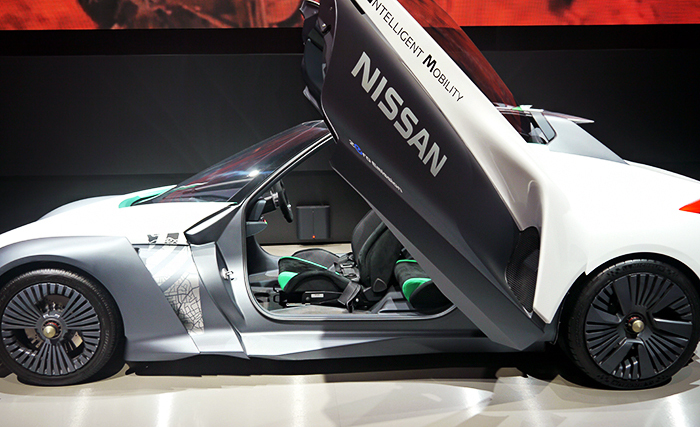 Nissan BladeGlider is an electric vehicle for car-lovers that epitomizes Intelligent Mobility. 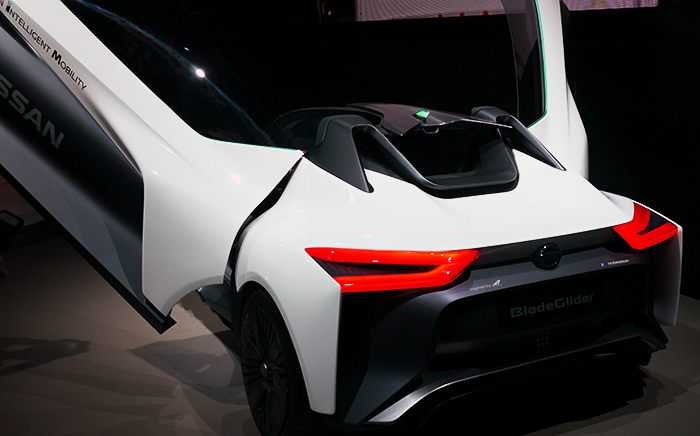 Nissan’s BladeGlider was one of the most attention-grabbing prototypes showcased at the Self-Driving Technology Marketplace. The three seater is an all-electric sports car that goes from 0 to 60 mph in just under 5 seconds with a top speed of 120 mph. The vehicle is designed to be environmentally and driver friendly. A mirror-free design for improved aerodynamics features two rear-view screens in the cabin. Due to its highly efficient aerodynamics and powertrain, the car is nearly silent. It is powered by a 220kW battery with a unique cooling system for both the battery and the motors. Figure 7. BladeGlider’s doors prop open in a vertical direction (side view). Figure 8. BladeGlider can go from 0-100km/h in under 5 seconds (rear view). Figure 9. Demonstration of Hyundai’s autonomous IONIQ that utilizes VR technology. 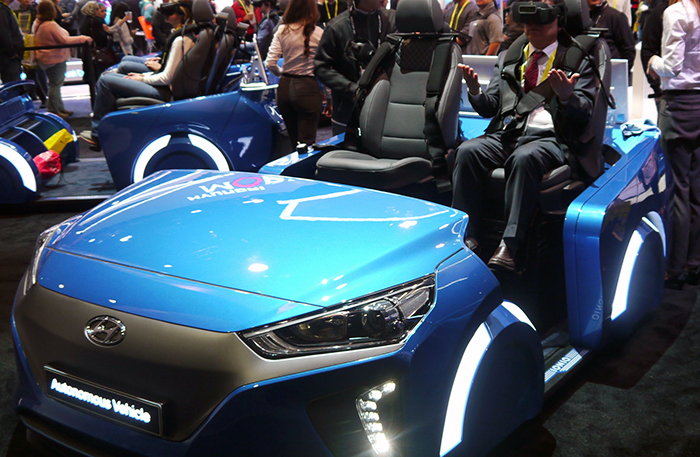 Hyundai was showcasing its autonomous driving system utilizing virtual reality (VR). We were invited into one of the Hyundai VR demo cars to experience what it would be like to ride in one of their IONIQ self-driving vehicles. The IONIQ is fully electric and is outfitted with a 28-kWh battery which provides an estimated range of 110 miles. A 100-kW fast charger can charge the battery up to 80% in just 20 minutes. Charging from a regular house socket is also possible but would take much longer. The interior is quite conventional with a large touchscreen between the two front seats, featuring most of the control functions. 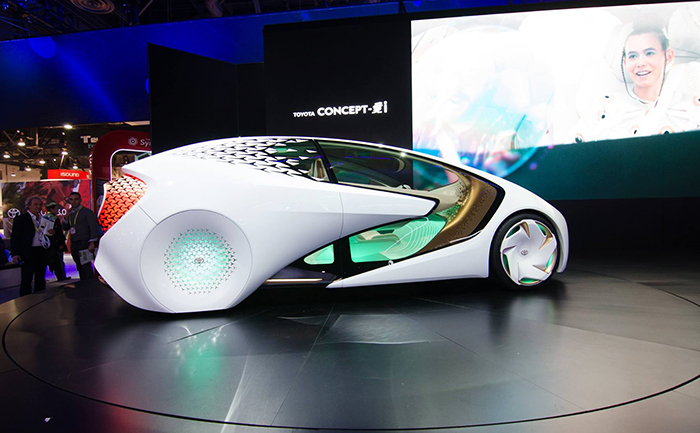 Concept-i is Toyota’s take on the car of the future. 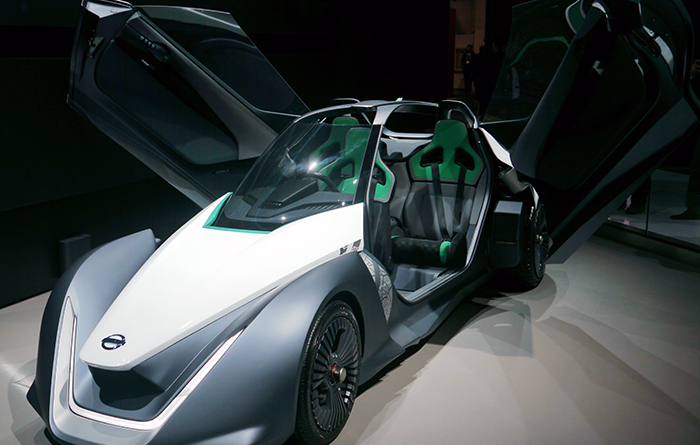 The vehicle is electric, autonomous, and looks like a car from sci-fi movies. The Concept-i maintains a good deal of conventional features, complete with steering wheel and traditional seating. Equipped with multiple biometric sensors, the Concept-i’s focus is on providing the most intuitive driver experience. The heart of the Concept-i is Yui, an artificial intelligence assistant that lives inside the dashboard, monitors the driver’s alertness and can jump in whenever necessary. Yui travels through the interior to create a truly immersive experience. Figure 13. Elektrobit’s autonomous mini cars feature the company’s highly automated driving (HAD) technology – EB robins. Elektrobit’s autonomous mini cars are equipped with ultrasonic sensors, cameras, and accelerometers and can read signs and navigate through a small track as shown in the demo video below. The cars run on EB robinos, a comprehensive software architecture for automated driving systems. It is considered one of the most advanced systems for HAD. 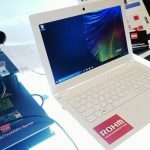 Inputs from the sensors can be fed into EB robinos, which acts as the central processor unit to ingest the data and analyze the situation before acting on it in real time. The cars also feature automatic parking systems and can park on their own even when the batteries are running low. 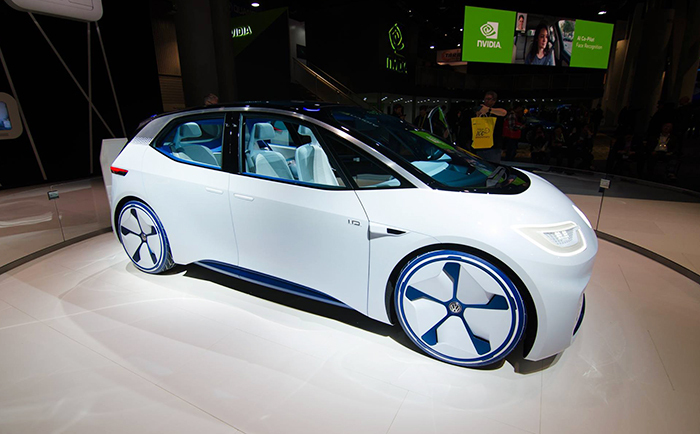 Volkswagen showcased its electric concept car, the ID, in the US for the first time. The ID is able to go somewhere between 250 and 375 miles per charge and it can accelerate from 0 to 60 mph in 8 seconds with a top speed of 99 mph. 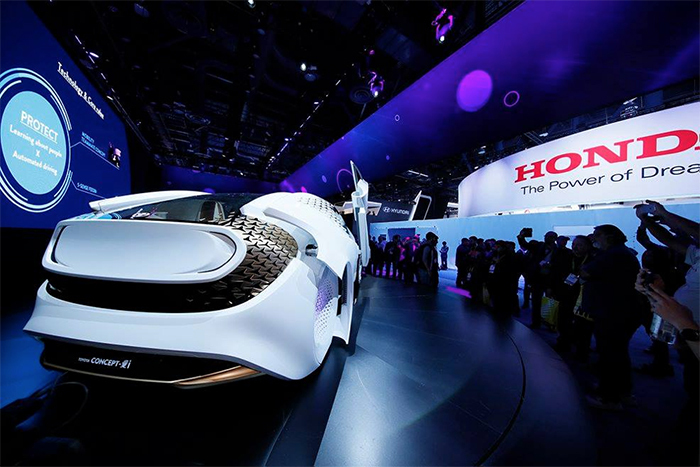 Initially, the car can be charged via a plug connector and inductive charging pad in the future, which will be able to charge the battery up to 80% in 30 minutes. Its floor is completely flat and the front seats revolve fully to face the back seats. VW expects the ID to appear on the market by 2020 as with other electric vehicles. VW also plans to add an autonomous driving option by 2025. In the autopilot version, the steering wheel will retract into a dashboard, leaving free space in the cabin. Figure 16. Segway’s consumer electric scooter lineup: (Left to right) One S1, miniPro, I2 SE, and X2 SE. 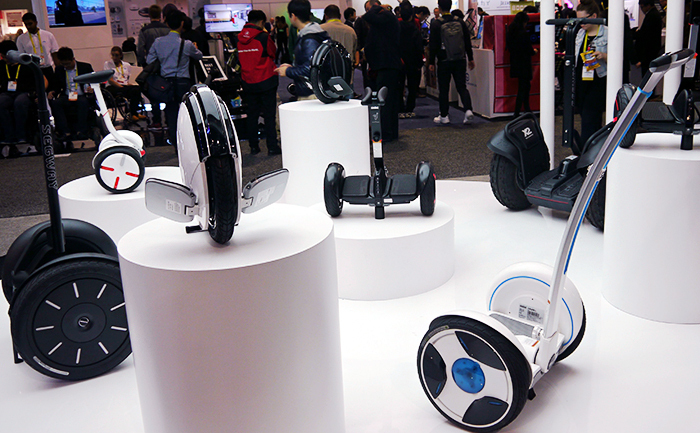 Practically setting the grounds for the category of “Personal Transportation Robot”, Segway showcased its full line of consumer products at this year’s show. The company focused on their presentation of two main models: the miniPro and the One S1. Both models offer hands-free riding and app integration. The miniPro features a unique knee control bar, while the One S1 emphasizes its portability. Figure 17. 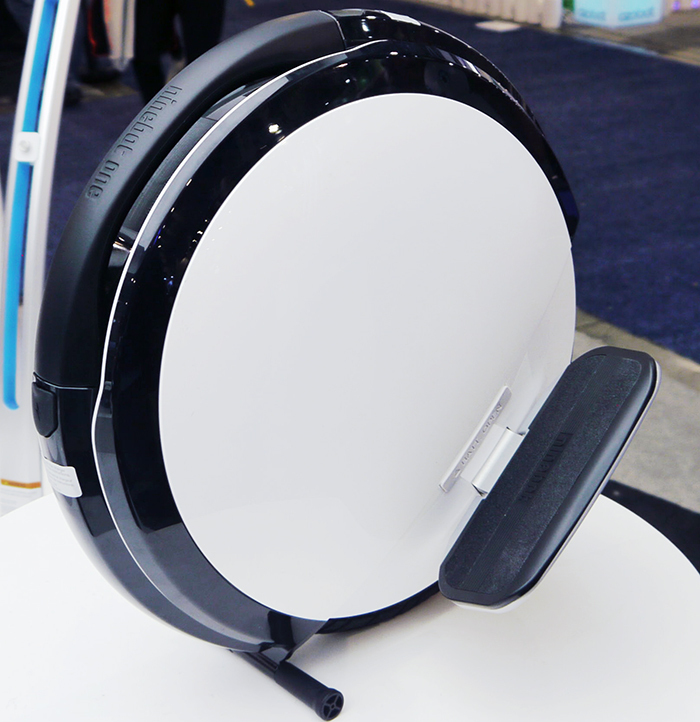 Segway’s miniPro is a hands-free, two-wheel electric self-balancing scooter. The miniPro is powered by a UL-certified lithium-ion battery that allows a trip up to 14 miles on a single charge and can speed up to 10 mph. It can accommodate riders weighing up to 220 Ibs and take on slopes up to 15-degrees. Its unique knee control allows easy and precise maneuver, which can also be adjusted to each individual rider. This scooter is lightweight, built with durable aircraft-grade magnesium alloy and military-grade shock absorption-capable tires. Using its dedicated app, you can view riding tutorials, customize light colors, modify safety features, operate the miniPro via remote control, and more. It has the option to set up tamper-proof anti-theft alarm that triggers alerts when somebody, other than the user, tries to move it. Just a mono wheel with two platforms for rider’s feet, One S1 is a compact electric scooter that boasts a unique design. It weighs about 25 lbs and measures 16.6 x 7.2 x 17.6 in. It speeds up to 12.5 mph and has a range of up to 15 miles on a single charge. It comes equipped with 150 Wh lithium ion batteries. 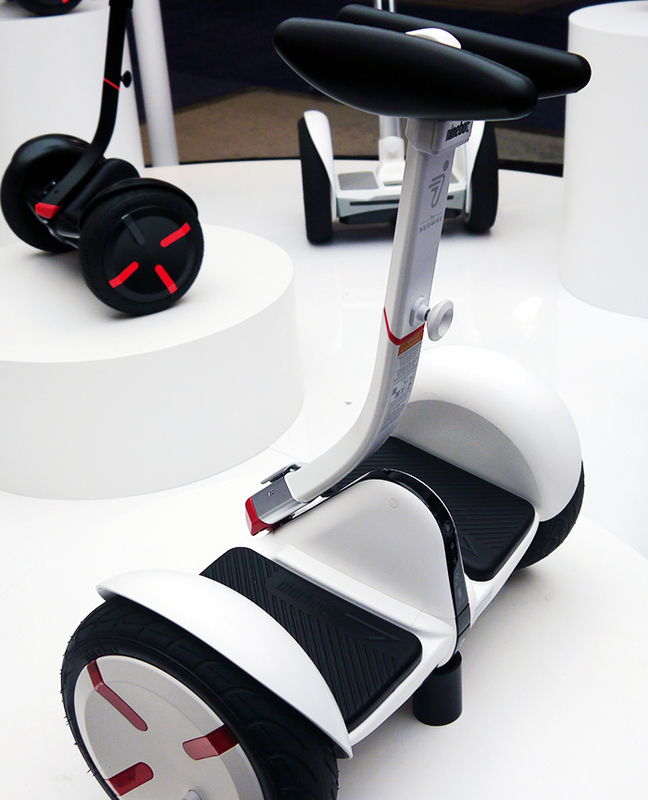 Its Bluetooth function enables an anti-theft feature, firmware updates, and more via the Ninebot App. Users can also monitor speed, turn on speed limit mode, customize lighting of the bot, and enable lock mode using the app. Accessories include training wheels, protective bumpers, graphic decals and a kickstand. Figure 19. 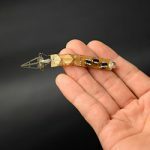 CellRobot connects different types of cells to create a fully functioning robot. 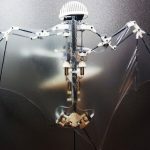 Much like any other lifeform, CellRobot connects cells to create a larger system – a moldable robot. 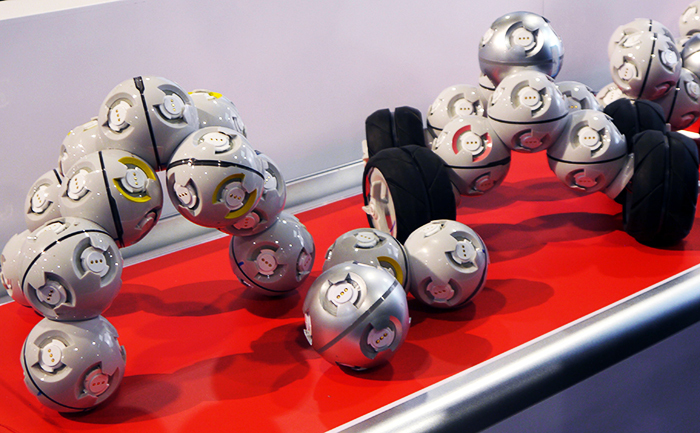 It is the first robot that can be assembled into any form imaginable. Just like cells in our bodies, different cells have different purposes and when combined, they become one functioning robot. The HEART cell powers the robot and acts as the brain. The CELL is a servo rotation system with an independent MCU (Microprogrammed Control Unit). The wheel module allows the robot to move around, while the vision cell provides a wide angle lens for surveillance. 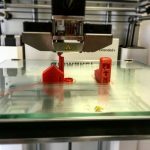 Using CellRobot’s app, users can follow instructions on various pre-uploaded shapes. Users can also create their own designs/shapes which can be saved in the app. This dynamic robot allows the user to learn the basics of Robotics through hands-on experience. Currently, CellRobot provides an open Hardware Platform Interface (HPI), and its API will soon also be open to users. Figure 20. Litter Robot automatically changes its litter box and notifies the user when the waste drawer needs to be changed. 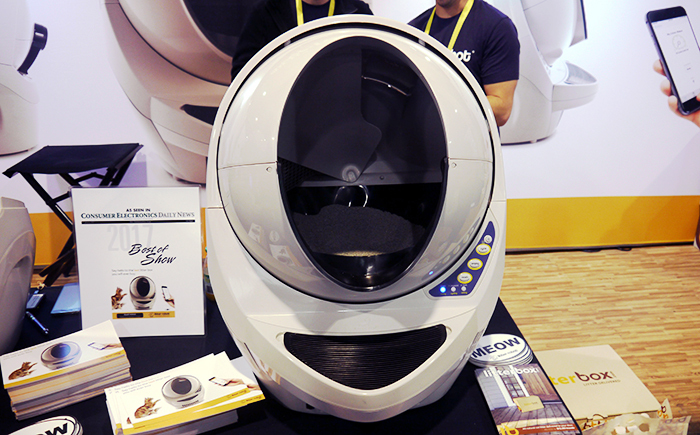 The Litter-Robot is an automatic self-cleaning litter box. Its sifting system automatically separates waste from clean litter, so no scooping is necessary. The waste drawer has an indicator light and notifies the user via mobile app when it is full so that it can be emptied out. It works with any clumping litter and has a carbon filter that helps prevent odors. The Litter-Robot III Open Air has an enlarged entryway of 15 ½” H x 10 ¼” W compared to previous models to fit larger cats. It works with larger cats than previous models (over 5 lbs), weighs 24 lb, and measures 29 ½” H x 24 1/4 “ W x 27”. Open Air has an adjustable cycle timer, allowing the user to set the self-cleaning cycle to 3, 7, or 15 minutes after the cat leaves. It features a sleep mode and an automatic night light, as well as control panel lockout. 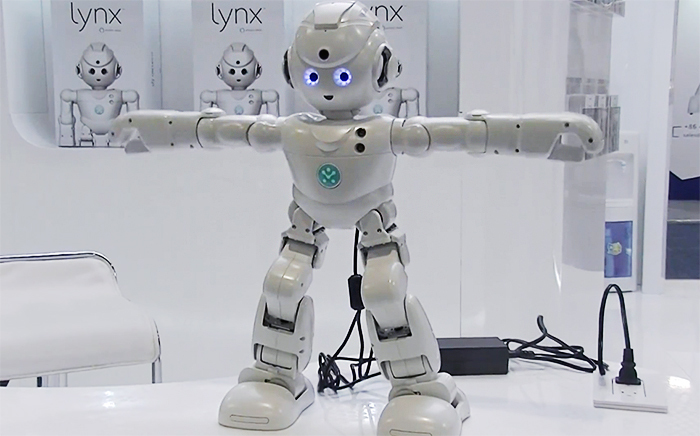 Lynx is a humanoid robot that integrates Amazon’s Alexa, offering a truly human-like experience. Just imagine Alexa with a cute robotic face, body and personality. That’s exactly what Ubtech Robotics did with Lynx. Users can have Lynx check the weather, play music, or read emails and dictate responses for them. Lynx can also be used to spy on house pets, unsuspecting family members, or housemates! The company plans to release the robot in late 2017.